During the first week of October our Managing Director, J.M. 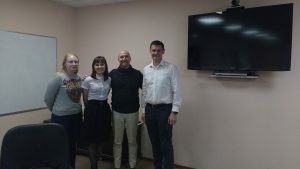 Pereira, traveled to Novotroitsk in Russia to provide a training course on the software for a main player in the region: YUGPK – South Ural Mountains Processing Company (http://www.yugpk.ru/). YUGPK is the leader in the region for cement manufacturing, with a state-of-the-art factory with a capacity of 2 million tons of cement production per year. To reassert their role as a market leader they will use Concrete Quality as the main tool to provide technical support for their customers. We consider this to be an excellent way to increase the value they provide to their customers, as knowledge is always the most valuable resource. By using Concrete Quality their technical support team will be able to quickly and effectively provide support for mix designs optimization, raw materials quality control, suppliers selection, production control and troubleshooting to YUGPK’s customers.